Continuing the ongoing series of interviews with creative artists working on various aspects of movie and TV productions, it gives me great pleasure to welcome Steve Saklad. 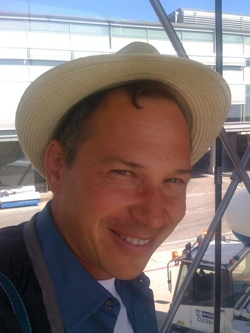 After doing art direction for films such as “The Game”, “Red Dragon” and “Spider-Man 2” for the first part of his career in Hollywood, in the last decade he did production design on a variety of productions including “Juno”, “Up In The Air”, “The Muppets”, “Labor Day” and, most recently, the pilot episode for the TV show “Empire”. In this interview Steve talks about his theatrical background, the changes that the art department is undergoing in the last decades, his involvement in pre-production and production phases of his films and his work on 250 (and counting) commerials. In addition, he takes a deep dive into the production details of the “Empire” pilot, “Up In The Air” and the beautiful atmosphere of “Labor Day”. Steve: I’m a theater person deep down. Raised on musical theater since boyhood, I spent all my time in the theater department at my undergraduate college (Brandeis University) and trained in Set Design along with Costumes and Lighting at Yale School of Drama for my graduate degree. I arrived in New York with my sketch and drafting portfolio in the summer of 1981, ready to design my first Broadway show. 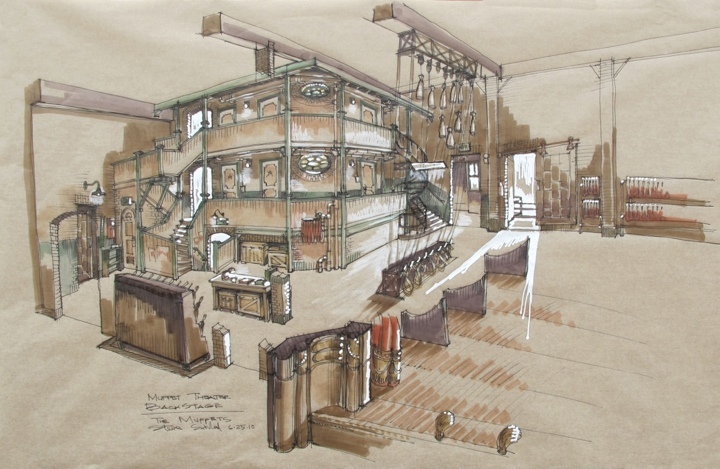 I designed a few off and off-off Broadway shows during the decade, but primarily was first assistant to the top Broadway set designers on some of the great shows of the 80’s. Little by little, drafting for Broadway seguee’d into drafting for movies. By the 90’s I was a feature Art Director, now living in Los Angeles, and designing commercials on the side. After all that prep time, I was good and ready when my first Production Design opportunities in indie films came along in 2004. Kirill: What drew you into the world of the art department, and what – if anything – has changed for you since you’ve started working on your productions? Steve: Like the set design department in theater, the work of the Art department is all about creating a world that didn’t exist before you started. It could be operatic, super-natural or documentarian, it could be the fantasy world of “The Muppets“, or the banal real-world environment of “Up In The Air“. You’re setting the parameters and saying this is what’s important visually to tell the story you want to tell. That’s thrilling. 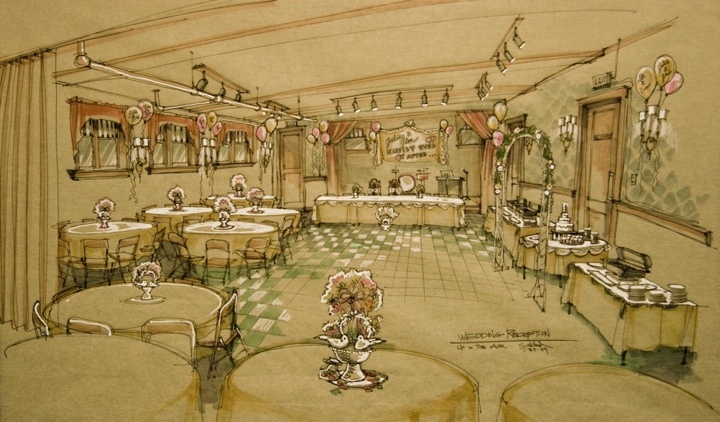 Sketch drawing for the backstage set of “The Muppets”. Courtesy of Steve Saklad. Changes since I began in the art department— how much time do you have? When I began, we drafted in pencil on velum paper which was then sent through a diazo machine to make a blue-line print. We carried pagers, sent approvals by fax, and kept quarters in our pockets to make emergency phone calls from pay phones on the corner. The computer revolution has changed the outer tools, but not the process. We still assemble moodboards by hand, still page through books for inspiration, still match fabric swatches with paint chips to arrive at a color pallet. Set models are now often digital versions on a computer screen, although I still prefer the old-fashioned 1/4″ paper models. I still find my way to a design by sketching in ink on buff yellow onion-skin paper and adding markers and whiteout to give it life. But I’m admittedly a relic of another time compared to most designers I know. Kirill: You’ve spent the first half of your career so far as an art director. What have you carried with you as you transitioned into the role of the production designer, and how does that affect your working collaboration with your art directors? Steve: It’s a great question. I know the nuts and bolts of running an art department as well as construction, paint and greens departments, I know how budgets are structured and what designs generally cost because I did that job for almost 15 years. I hope that means I’m more compassionate to my art directors, knowing what they’re going through to make our designs come to life. I’ve also been blessed with getting to work with some amazing Art Directors under me, who have taught me far more than I could ever teach them. It’s definitely a two-way street. Sketch drawing for the final scene in “Up In The Air”. Courtesy of Steve Saklad. The final still from the movie. Kirill: If you look at your few recent feature productions, when do you usually join a production and how do your days look like in the pre-production phase? Who do you work with, and when do you start hiring your department people? Steve: Bigger budget features usually give you 8 to 10 weeks of prep, the mega-movies like “Spider-Man 2” plan 16 to 20 weeks of prep, and the lowest budgeted shows like “Juno” and “Thank You For Smoking” only gave us 6. (How on earth did we manage with so little prep? Somehow to our everlasting regret, we always do.) The production designer usually starts with nothing but a desk, a phone and if you’re lucky, a wifi line. Locations will have already been on for a couple of weeks looking for locations. Within a week of employment, you generally get to start an Art Director and an Art Department Coordinator. A week or two later you get your Decorator, Set Designers, Graphic Designer, etc. Propmasters, Leadmen, Construction and Paint teams start anywhere from 3 to 6 weeks before principal photography. Most of prep, the days often look the same: the morning is spent wrangling designs, draftings, sketches, set dec choices, clearance meetings, etc. The afternoon is always spent in a car with a location manager or scout looking for the 60 or 80 various locations needed for the picture. For every location that makes it into a film, assume the production designer has personally been to 5 or 10 reject choices. Kirill: What happens for you once the shooting starts? What’s your involvement with the set for the day, and with the sets still to come in the shooting schedule? Steve: My ultimate responsibility is always to the director, getting on his wavelength and bringing his vision to life. So nothing is more important than opening every single shooting day wherever he is. I want to know that the hero shooting angles I imagined when I chose the decor are still what the director will use, and if he sees a moment while the actors are rehearsing that means a whole new shooting angle, I sure want to be there to redirect the decor to match the new angles best. If he is suddenly appalled at a paint choice when it appears on the wall, my job is to improvise hanging a drape over the offending wall so the shooting can go on that day. Once everyone’s comfortable with the day’s shooting set, I’ll generally cycle through: 1. the next day’s location where construction and set dec are installing the new design; 2. the stage where the big builds are progressing and future set pieces need paint approvals; 3. the art department where graphics and set designers’ work all need approvals and direction; 4. revisit the shooting set at lunch in order to get director’s approvals on future builds; and 5. repeat the cycle as necessary to keep all the juggler’s balls in the air without dropping any. Sketch drawing of Adele’s house front exterior. Courtesy of Steve Saklad. Establishing shot from the final movie. Kirill: Do you get to stay with a production into the post-production phase, or is it mostly out of your hands? How do you make sure that the environments you’ve created stay true to their purpose? Steve: My last working day is the last day of principal photography. Given the frequency of computer-generated set extension now in use, my job is also to lay out those virtual set choices while I still have my design team at their tables during the body of the shoot. If I haven’t laid out those designs that will be virtual during my tenure on the show, I’m taking a chance that the producer in charge of post will make choices I can’t abide, and then it’s too late. Kirill: How much of your work we see in the final frame, and how much “extra” you create to wrap the cast and crew in the specific environment? How important is that aspect to what you do? Steve: My goal is to make a set that’s just complete enough so that every single detail shows up on film and I haven’t wasted a penny of the budget on a drop of scenery or decor choice beyond that. In practice, I can never truly know what the camera will or won’t see. Will an actor open that drawer or this cabinet door? Will the crane boom up and spot where we stopped painting the age on that porch roof? For this multi-room apartment stage build, is the director planning to roam with the camera outside the windows looking in, which requires that I complete the brick face and ivy out there? We want to make the world of the film as complete as we can (and only for the benefit of the camera or actors, never never extras for the crew’s enjoyment!). Kirill: “Labor Day” marked your fourth collaboration with the director Jason Reitman. Does it get easier once you find the right rhythm to work with the same people across multiple productions? Steve: Yes and no. I love the history that Jason and I share (along with his 1st AD Jason Blumenfeld, DP Eric Steelberg, and costume designer Danny Glicker). And we do have a shorthand and trust in each other that gets us far in the process. But every film is a different animal and some are simply easier and some are as tough as if we had never worked together at all. I’m enormously proud of “Up In The Air“, but man, was that a tough tough shoot— middle of the winter in St Louis for most of it, a very bleak arc of firings and downsizings in the story, and an endless parade of soul-sucking offices and airports to put on camera. “Juno” on the other hand, was only our second film but was an absolute joy to do— lovely story with four seasons to put on film in 6 weeks of filming up in beautiful Vancouver. “Labor Day” landed somewhere in between. Plus it was our first true period movie together, which set up its own challenges and rewards. Kirill: Can you talk about the initial process of defining the visual language and designing the sets for “Labor Day”? Steve: It all started with the character of Adele. Who she had been, what her history was, and how she had ended up in the home we see in the film. We soaked up photo books by Stephen Shore and advertising collections of the 80’s, but also paintings by Edward Hopper and depression-era farm photos to arrive at the look of flashbacks for the 1960’s of Frank’s youth. Adele would live her life indoors even in summer, seeing the shadows of fluttering sunlit leaves making patterns on the lace-draped windows of the home’s interior. Screens covered every window and every opening of the back porch to protect her from the world outside. The color palette we explored was the world of dead leaves inside, contrasted with the red, white and blue, aquas and magentas of a patriotic 1987 Labor day holiday in the outer world. Kirill: How much work went into creating the main environment of Adele’s (Kate Winslet) house, and how much did you want to reflect her personality? Steve: It was clear we had to find a real house to become the base for the design of Adele’s home. The search for that house covered nearly half the state of Massachusetts, and I estimated personally visiting 80 to 90 houses myself. Jason wanted to travel freely from outside to inside with his camera, from the porch through the front door into the foyer and on into the kitchen etc. That told us we could never be happy with a build onstage. The house we ultimately found in Acton Mass had sadly just undergone a modernization inside and was a deep olive color outside with pristinely mowed front and back lawns, but it had the scale, the distance from the street and the bones we were looking for. 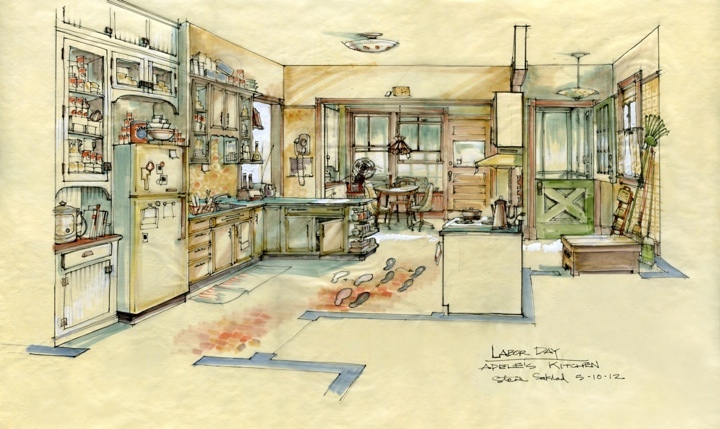 Sketch drawing of Adele’s kitchen. Courtesy of Steve Saklad. So began a 6 week process of: building screened porches front and back, adding a 1920’s garage facade to the modern garage, blasting out their kitchen to create a dramatically bigger space with old-world nooks and crannies, adding false eaves for a sloped ceiling in Henry’s bedroom, repainting, papering and aging every wall surface inside and out to show the history of failed home improvements over the decades, decorating every corner with the range of Adele’s hobbies and interests, and adding the overgrown grasses, vines and wildflowers that cover Adele’s exterior when we first meet her. Final stills from Adele’s kitchen. Kirill: The last couple of scenes offer a glimpse into how the house “aged” around her as her son went to college and started his own adult life. How did you approach that process? Steve: We had plotted a very precise progression of growth and coming alive to Adele’s yard, not all of which made it into the movie. We even shot a scene where 16-year-old Henry comes back to her house and mows the lawn. (I was very sorry to see that scene gone from the final film.) 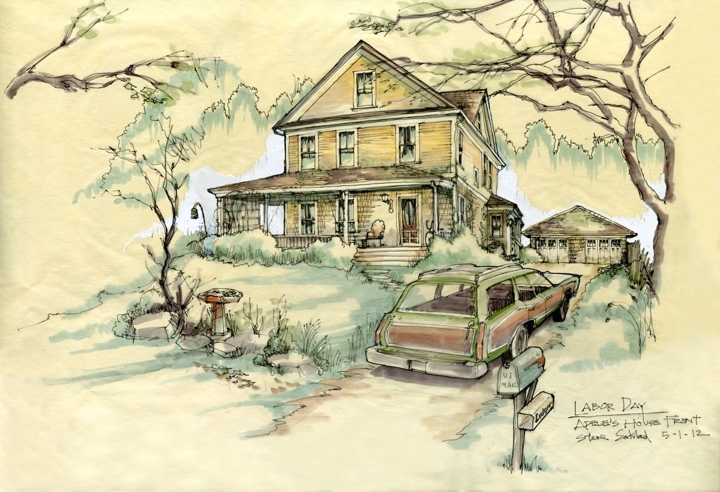 But in the years following 1987, she was meant to go downhill, but then come back to life and bloom in her own right, and that story was reflected in the fresh coat of yellow paint and bursts of lavender wildflowers and potted blooms lining the porch steps in the last scenes. The exterior of the house when Adele’s son comes to visit from college. The exterior of the house in the final scene as Adele is reunited with Frank. Kirill: The main storyline flashes back to the back story of Frank (Josh Brolin) and the path of his character. How much were you able to tell through those short moments, and how did you approach designing the sets that are only seen for a very few brief moments? Steve: Ah, well, you see they never were short glimpses of scenes in the script we shot! The scenes of Frank’s boyhood on the Berkshire farm in the ’60’s was scripted and shot as fully as all the later scenes. We even shot a scene where his grandmother (whose farm it is) actually teaches him to bake those luscious pies! Every room of that house was fully detailed for an old farm-lady’s taste in 1965, not to mention the series of Bus Stations, Bars, Hospitals, Bowling Alleys, and Justice of the Peace offices we created for those sequences. I was so sad to see them mostly gone once Jason and editor Dana Glauberman landed on the montage technique to tell Frank’s story when they got into the editing room. Kirill: Going back to your previous collaboration with Jason – “Up in the Air” – set in these big open spaces, hotels, offices, airports. Does that give you a bigger canvas to work with, or is every project its own microcosm that needs to be carefully designed at its own level? Steve: Right, back to those soul-sucking spaces. Fine. The fascinating thing with the locations in “Up In The Air“, is that virtually none of them had a personal human touch, and this was by design. Obviously that’s true of the offices, the “firing” companies as we tagged the various targets for downsizing Ryan Bingham travels to, plus hotel rooms and conference rooms, airports, executive lounges, and airplane interiors. Even Ryan Bingham’s faceless white apartment was devoid of personal touches— for him it was just a temporary way-station to being back in his beloved artificial “air-world”. That’s why it was such a joy to design the small-town wedding sequence for his sister that happens back in Wisconsin later in the movie. At last we could inject a little personal character and color— we installed the moldings and wallpaper you see in that beloved Church basement room where the party takes place, not to mention the charming tabletop decor the bridesmaids would have crafted together on their small-town budget. Sketch drawing for the wedding reception in “Up In The Air”. Courtesy of Steve Saklad. 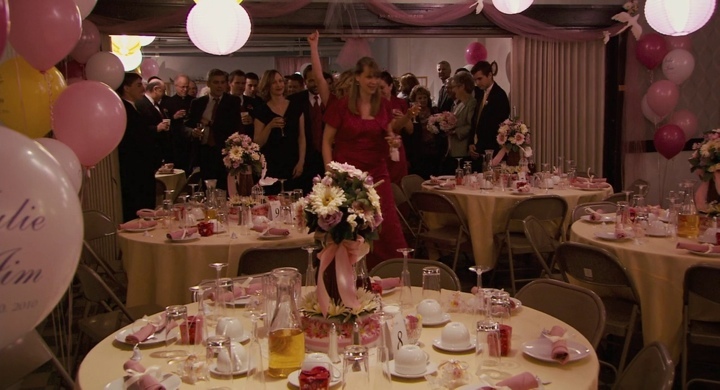 Wedding reception final still from the movie. One more sequence got some major color, and it’s another visual highpoint for me: that’s the tech convention in the Miami Hilton where our 3 leads let loose to the sounds of Run DMC in front of a wave backdrop. Orange! Cerulean Blue! Silver! That was among the last sequences we shot in the film, and to be in the Miami sunshine after the snows of the midwest was so appreciated! Kirill: In that movie, are we seeing real-life airports, and if so, how much were you able to work with and tweak those existing environments? 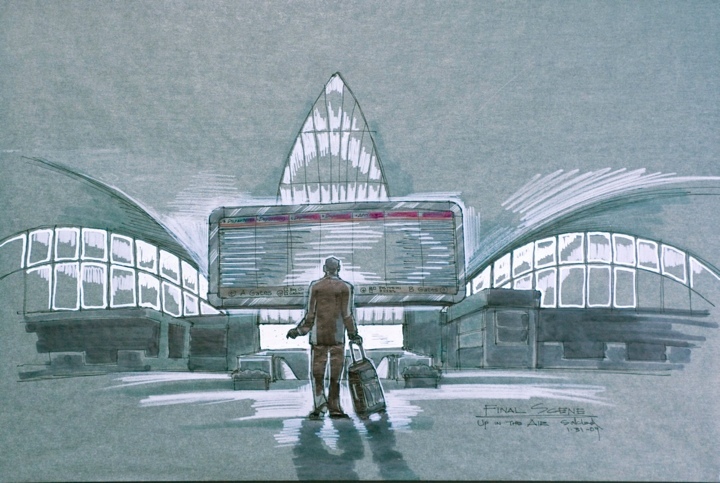 Steve: Since we couldn’t disrupt normal airport service, every single airport counter you see in the film was created out of an empty counter area in whichever airport we were in. All those corporate back wall builds for American Airlines, stanchions, carpets, standing graphics, vinyl signage, and even the swipe-machines were all created by us for the film. Though the film places Ryan in 10 or 15 airports in the story, we managed the looks we needed in Detroit, St Louis, Omaha and Las Vegas. Even that signature overhead look of the Miami airport floor with its brass inlays of shellfish was created by us back in freezing St Louis! Kirill: As you wrap up the work on a production – that most probably takes close to half a year of your time – what stays with you if you look back through the years? Do you go back and rewatch some of your work? Steve: Well, I get to keep my onion-skin sketches for each show (although they are technically owned by the studio). But the warm relationships with your fellow crew members are the best souvenir you get to take away from each show. Producers, directors, certainly art directors and construction coordinators are all folks you hope you get to work with again, or can give you a good word when the next employer calls for a recommendation. I always look forward to the premiere in the theater, but even more to the blue-ray release 3 months later— that’s when I finally get to see all those deleted scenes that we worked so mightily on, that ended up on the cutting room floor. 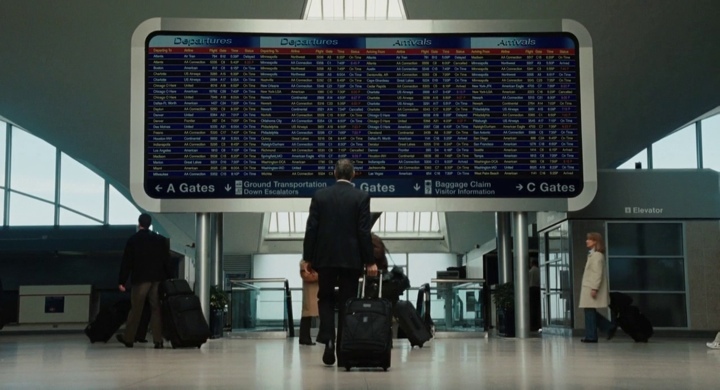 Office and airport spaces in “Up In The Air”. Kirill: Recently you worked on the TV pilot for “Empire”. How different is the balance of responsibilities on TV shows driven primarily by their creators that bring in different teams of directors and cinematographers for individual episodes? Steve: “Empire” was a thrill for several reasons. The script was a nail-biting mashup of the HipHop world and King Lear or The Lion in Winter (a grand play and film that is actually the precise template for Empire’s setup). I was working with the dazzling Danny Strong and especially Lee Daniels, with whom I had done my first indie feature 10 years before. And we were doing this incredibly ambitious story in 5 weeks of prep and 15 shooting days (plenty for a TV schedule, but killer for getting a big-canvas feature film look). The schedule prohibited building huge sets for the pilot— we created every space within existing locations, augmented with some wall builds, paint and paper, grand art installations, graphic statements, full set dec, even all the veneer wood surfaces you see in Luscious’ office and the Yacht interiors. The story of “Empire” is a story of different versions of egoism. Hence the giant logo of Terence Howard’s face as the emblem of the company, or the 10′ square Kahinde Wiley canvas that looks like son Hakeem on a rearing stallion that dominates his pad. As for the revolving door of directors and show runners that come when a show becomes a series, well I was spared all that. My last day was the day the pilot wrapped. 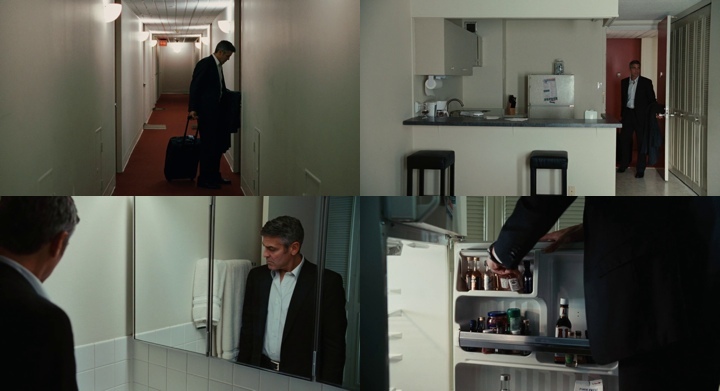 The faceless white spaces of Ryan’s apartment in “Up In The Air”. Kirill: You also have more than 250 commercials under your belt. Does that give you an opportunity to flex different creative muscles on a much shorter production schedule? Steve: Commercials can be fun and commercials can be lucrative, but at heart, they are a means of selling toothpaste and cars. Often it can be done with great artistry, but you serve many more masters than on a normal film: the director, the producer, the production company, the agency, the client. So choices are more conventional, and decisions are all made in a group setting. That said, they are a godsend for making great relationships with directors and DP’s who come from the feature world, and they keep you and your team happily employed through all those fallow months between films. Frankly I’d be lost without them. Kirill: Looking back at your 20+ years in the art department, would you have made the same choice again? Do you see yourself continuing down this path in your future? Steve: To circle back to the beginning, I’ve always wished I could have the career I do now along with a successful career in theater design. The more times I can design a theatrical film like “The Muppets” which for me was a tribute to the Broadway theater world, the more I can integrate both sides of my designing mind, the happier I am. Oh, to be on the next period movie musical that comes along! Kirill: And finally, on a related note, what is next for Steve Saklad? What can you tell us about your ongoing work? Steve: I’m writing these notes from New York City where I’m prepping a romantic comedy feature for New Line called “How To Be Single” that will come out Valentine’s Day of 2016 (of course). And looking for those movie musical scripts in my email inbox. And here I’d like to thank Steve Saklad for graciously finding time in his busy schedule to answer a few questions I had about his art and craft, and for sharing the background materials for the interview.